उत्तर प्रदेश के सरकारी नौकरी पेज में आपका स्वागत है उत्तर प्रदेश में निकलने वाली सभी सरकारी नौकरियों (UP Government Jobs 2019) एवं की लिस्ट नीचे दी गयी है कृपया इस पेज को बुकमार्क कर लें ताकि भविष्य में आप आसानी से सरकारी नौकरियों की लिस्ट आसानी से प्राप्त कर सकें, धन्यवाद !! 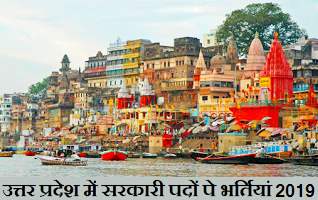 Note:- UP Govt publishes various Rojgar Samachar & govt jobs in UP, To get job alerts for UP govt jobs, Please visit our website regularly here we publishes current jobs openings & sarkari naukri in up for government jobs & Sarkariexam in uttar pradesh and other govt jobs 2019. Do not forget to subscribe our newsletter for latest UP Rojgar samachar. To check latest sarkari naukri in uttar pradesh you can visit our job website employment-news.net here we upload all the government jobs published by up government on daily basis. You can also visit this page on regular basis to check all the govt jobs recruitment near up and other state, We also upload jobs published by central government for particular state. You can get eligibility and syllabus information about the particular job vacancy in the given official pdf. You must check your eligibility for any job before applying. Syllabus is also very important information to know because it is the information that will make you to decide to go through that vacancy or not. Uttar Pradesh Government Consistently Publishes various jobs to fill all the job vacancies in various department, The information is published through various govt websites, News Papers & Other mediums, All the people who are interested in working with up government, Try to be aware about every govt recruitment information published, We also try to include each and every job information published by government. Application process for up govt jobs is same as other job vacancies published in other states of India, All you have to do just go through the online applying link and fill the online form. After filling online job application, you will be asked to pay online application fees. After filling all the details you have to take print of submitted application form.